As a Human Rights student the British Institute of Human Rights is the place to be! To see how human rights are applied in real life, as opposed to an academic environment, is an amazing opportunity, and during my two months of volunteering I have gained invaluable experience in how human rights are brought life. I particularly enjoy seeing how we work with human rights outside the courtrooms. By working together with organisations on how to implement human rights policies, training practitioners and raising public awareness, human rights are less likely to be violated in the first place. When you hear about the success stories resulting from such preventive actions it makes you feel positive towards the future of human rights in the UK and proud of the BIHR. A benefit of volunteering for a small charity is that you have the opportunity to see all aspects of the organisation, which makes the day-to-day tasks wide-ranging. Another advantage is that there little red-tape so you can get stuff done and make a real impact! The staff at BIHR is very knowledgeable and passionate about human rights, and it is incredibly inspiring to be a part of such a dedicated team. Whilst everyone is working immensely hard, we also have lots of fun. I am confident that the skills I have gained will prove useful in the future, and that my time with BIHR will be an unforgettable memory. I have been working as the Administrative Assistant for the British Institute of Human Rights for 11 months and 2 weeks, every day of which has been a journey. Prior to working at BIHR I have worked a variety of different workplaces, some large, some very large, most I did purely to collect a wage, and none I have enjoyed as much as working at BIHR. We are a small team at BIHR, even by the standards of small charities, but I am constantly amazed by the field of impact and scope of issue that my colleagues are able to respond to. Often at short notice they produce well informed, legally sound but accessibly presented interpretation of the fast paced and complex world of UK human rights law, policy and practice. I have seen how, by providing sober and accurate resources, briefings and response pieces, BIHR have been able to help explain and promote human rights protections and duties to large numbers of people and organisations for whom human rights would have remained something relevant only to other countries. Much of this work would be impossible without the integral role played by our tireless and committed volunteers who donate their time to BIHR, helping us to research breaking cases and generally pitching in with the team to get stuff done. Our small size is no hindrance to our large impact because of a large and diverse network and community of other small charities around the UK, from one person operations to regional outposts of national groups, tirelessly working to end inequality and injustice, to create a fairer society for all in the UK. I have experienced the breadth of expertise and wealth of passion and drive in this sector through my work organising BIHR’s Human Rights Tour (watch this space for information on the 2014 Human Rights Tour), through BIHR’s annual celebrations for Human Rights Day, and through the great support and engagement from small (and large) organisations signing up to show their commitment to human rights through the Human Rights Charter and the Human Rights Alliance. Working at BIHR has shown me that being a small organisation, in tough economic times, need not be a roadblock to success if you are rich with commitment to the vision and purpose of your organisation. And that is why I love working at a small charity, and that is why I love working at BIHR. Small charities are the unsung heroes of our civil society. In small places, close to home they have an impact way beyond their limited resources. Small national charities often lead the way in developing solutions to the challenges we face. They are remarkable for their willingness to focus on the often neglected and sometimes unpopular causes, working to champion the rights of people who are most at risk of disadvantage, poverty and exclusion. The British Institute of Human Rights is a small national charity with a big Impact. Across the UK, we help people and organisations understand that human rights are the standards by which a decent society should live. We help people understand that our Human Rights Act is a 21st Century Bill of Rights – a modern Magna Carta which celebrates our contribution to the rule of law over the centuries but which also recognises that we still have much to learn. I love working for a small charity because of the sense of team work and the shared commitment that exists across the whole BIHR family. It is great to work somewhere that can respond quickly to changing circumstances, and which can stay true to its values however difficult the challenges become. And I love working for BIHR because we are connected, through our UK-wide Human Rights Tour and practice based work, to so many other people and organisations who are passionate in their belief that every member of the human family is of equal value, and that universal international human rights are ours to cherish and defend. I’ve been volunteering at the British Institute of Human Rights for four months and I can’t imagine anywhere I’d enjoy working more. BIHR is a charity that is only small in the sense that every member of staff (plus the volunteers!) fit in one office. Nothing I have done here has ever felt small, and the projects I work on are based anywhere from the very top of the UK to the very bottom. Helping a small charity on big projects has also meant I’ve had the opportunity to really put my skills to the test. When important human rights cases happen that change how the law affects the people we work with, I help get the rest of the team on top of the detail and what the case means. Mostly though, I love working for a small charity because I have learnt so much more than I ever thought was possible. Being in the same office with people who have an amazing amount of expertise and experience in the field of human rights means that I have only got to shout out a question if there is anything I want to know. The office is always so busy and yet the amazing staff are never too busy to teach me and the other volunteers something new. Every day at BIHR brings something new to do; I’ve tried my hand at blogging, badge-making, fundraising, tweeting and baking cakes and though I’ve not yet had to knit a chicken I really can’t think of a place where I could learn as much or have more fun, and that’s why I love volunteering for a small charity. At the end of our lives, 68% of us will die in hospital. Of that percentage, 80% will die with ‘Do Not Resuscitate’ (DNR) orders in place. These are the sobering figures Lord Dyson quoted when delivering today’s Court of Appeal judgement which confirmed that a person’s basic human rights can be breached when a DNR order is placed on a patient file without consultation. The case (Tracey v Cambridge University Hospitals NHS Trust) was about Janet Tracey, a care home manager, who was seriously ill with terminal cancer and had to be ventilated following injuries sustained in a car crash. In the course of Mrs Tracey’s treatment, when she was about to be removed from artificial ventilation, a DNR order was placed on her records. The removal of the ventilator was successful and Mrs Tracey was able to breathe unassisted. Later on Mrs Tracey’s daughter looked up what was meant by the term ‘DNR’ which she had seen written on her mother’s records. She was distressed to discover that had her mother’s heart stopped (cardiac arrest) during her treatment, she would not have been resuscitated. At the request of the family, the hospital removed the DNR order. Janet, her family and medical staff were then able to discuss end of life matters, and subsequently decided that they would place a DNR order on file. A little while later, Mrs Tracey died in hospital. The family were concerned that the first DNR had appeared on Mrs Tracey’s records without any consultation. They asked the courts to decide whether this breached her right to respect for private and family life which is protected by the Human Rights Act (Article 8). In other words, Mrs Tracey was lucky, and being lucky does not mean the decision to place the first DNR on file respected Mrs Tracey’s human rights. In the future others who may have been subject to DNR orders without consultation may not have been so lucky. The Court also said it was not enough that the DNR order was cancelled when the family raised concerns. Mrs Tracey’s human rights were engaged by the underlying policy that led to a decision being made without consulting her. It was not the refusal to resuscitate that was being challenged, but the policy that led to decision being made without involving the Tracey family. Why is this about human rights? Clearly, the right to respect for private and family life was engaged in Mrs Tracey’s case (and other end of life decisions) and should be a vital part of the decision making process. When deciding whether Mrs Tracey’s human rights had been breached the judge said it is clear from previous decisions in the European Court of Human Rights that the degree of patient involvement in end of life decisions required by Article 8 will depend on the particular circumstances of the case. But this right also carries with it a presumption of patient involvement, and there must be very convincing reasons for not involving the patient. There is a principle in common law that a patient cannot force a doctor to give them a particular treatment, including resuscitation. Lord Dyson explains this does not mean the patient is not entitled to know about the doctor’s decision, to discuss it with them and if appropriate, request a second opinion. Importantly the Court also said that just because a patient may be distressed by a discussion about non-resuscitation, as Mrs Tracey was, does not mean they should be excluded from the decision. The doctor may only exclude a person from the decision process if “he or she thinks that the patient will be distressed by being consulted and that that distress might cause the patient harm”. By the time the case was heard in the Court of Appeal, the hospital had rewritten the policy regarding DNR decisions. The Court notes that the new policy respects the Article 8 rights of patients by involving them in decisions where doctors think a DNR order is necessary. However, the previous policy which had led to a DNR order being placed on Mrs Tracey’s records without consultation had breached her human rights under Article 8. The right to respect for private and family life is not absolute. It is a qualified right, which means officials can restrict it when there is a law in place to allow such a restriction and when it meets one of the aims set out in the Human Rights Act, e.g. to protect the rights of others. In any event, any restriction of the right must always be proportionate. This means all alternatives should be considered, and the decision maker should not simply jump straight to the most restrictive option. Following Mrs Tracey’s case, when a doctor assesses whether discussing a DNR order with a patient will distress them enough to cause “physical or psychological harm”, they will have to balance this harm against the potential harm to the patient’s rights if they do not include them in the decision. Sadly at the British Institute of Human Rights we know that MRs Tracey’s case is not a one-off. We work extensively in the health and social care sector, both with doctors and nurses and advocates supporting patients and families. The issue of DNR orders being placed on people’s files without consultation is something we hear all too frequently. In one instance a 51 year old man with Down’s syndrome and dementia had a DNR order put on his file without him or his family being consulted. The reasons given on the form were listed as: ‘Down’s syndrome, unable to swallow… bed bound, learning difficulties’. He and his family argued that this was discrimination and that it breached his right to life under Article 2. The case was settled out of court and the NHS Trust apologised. In another instance a worker for an advocacy group we’ve supported visited her client, an older man with dementia, on the hospital ward. She found a DNR order on his file and when she asked staff about this was she was told that everyone on the ward had a DNR automatically. The client was not aware of the DNR. However his advocate believed he had capacity to take the information on board, as well as having two daughters who had visited but were not consulted or informed. The advocate challenged the blanket use of the DNR orders with staff, explaining that she thought this raised serious human rights issues, especially the right to life not to be discriminated against. The DNR was withdrawn. Clearly human rights need to be part of the decisions made every-day by staff in health and social care. A human rights approach helps staff to do this, empowering them to see the law as not merely a compliance issue for lawyers but part of their everyday practice. BIHR’s new resource The Difference It Makes: Putting Human Rights at the Heart of Health and Social Care is designed to help practitioners do this, using a range of real-life stories. If you found this blog useful please consider supporting BIHR to win a competition for Small Charities Week 16-20 June 2014. 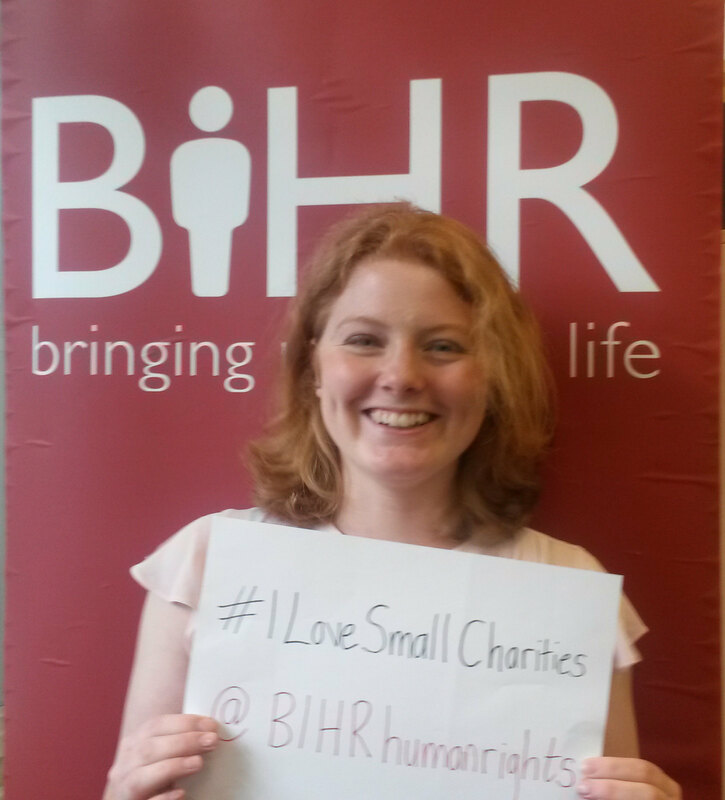 All you need to do is send a Tweet which says: #ILoveSmallCharities like @BIHRhumanrights because (and add you reason). As a small charity we rely on the support of those who care about human rights being respected, protected and fulfilled in the UK. Your Tweet could help us to win this competition! This Carers’ Week (9-13 June) we take a look at some important court judgments affirming the human rights of carer givers and care receivers alike. These judgments highlight the role of the Human Rights Act both in challenging poor decisions and its use in the decision making process. But remember it’s not all about the courts, BIHR’s Your Human Rights: A Pocket Guide for Carers is a handy resource to help people in their day-to-day interactions with public services, outlined at the end of this blog. There have been a number of cases where the proper procedures for altering care arrangements has not been followed. Although this may seem like a box ticking exercise, the result of such procedural failures has been to separate families. In one case a family carer had not been informed where their relative has been taken. The Human Rights Act has important role in such cases, empowering carers to hold services to account when officials have overstepped the mark. In RR v Milton Keynes Council, an 81 year old woman with dementia was removed from her home without warning and without authorisation. Her son was not informed where she had been taken and their contact was restricted. The court roundly criticised the conduct of the local authority. The authorities had violated the woman’s right to liberty protected by the Human Rights Act (in Article 5) by failing to get the proper authorisation to detain her in a nursing home. They were also found to have violated her right to respect private and family life under the Act (Article 8) by removing her from her home of 30 years and from the family that had been caring for her. This case bears striking similarities to that of the Neary family who took action against Hillingdon Borough Council; ; where Steven Neary, a young man with learning disabilities cared for by his father, Mark, was taken into respite care and then not allowed to return home for a year. Again the court criticised the conduct of the local authority in this case, which took place 3 years before RR. The court decided that the authorities had violated Steven’s right to liberty by detaining him without authorisation, for a number of months. And both Steven and Mark’s right to respect for private and family life had been violated because Steven had been taken from the family home and they could no longer enjoy life as a family. As well as the delays sought in authorising depriving Steven of his liberty in the care unit, the court criticised the use of safeguards.. Known as Deprivation of Liberty Safeguards (DOLS, set out in the Mental Capacity Act 2005), these are intended to safeguard people who have been deprived of their Article 5 right to liberty. Mark Neary, Steven’s father, was quoted in the judgement as saying “safeguards seemed good – the reality didn’t. I didn’t know where I was”. It was clear in Neary that the safeguards had been misused. Here measures which are supposed to ensure respect for the rights of people in care were used as a tool to ensure continued detention, and risks to the right to liberty. Clearly, reason for safeguarding are about ensuring people’s basic rights to liberty and to free from harm, in practice this was forgotten, which is why the Human Rights Act was needed to challenge officials and hold them to account. The case is important for carers. This test about whether a situation is depriving someone of their liberty applies whenever the state becomes involved in the provision of care. Where a local authority assumes responsibility for somebody’s care, they also assume responsibility to properly assess whether their care arrangements deprive that person of their liberty. If they do, then the proper safeguards must be applied. Baroness Hale is quick to emphasise that needing to apply the safeguards to a person’s care is not a bad thing. It is a crucial mechanism for ensuring that the person’s rights are respected while receiving care. The reviews required by the safeguards should be independent assessments which determine whether the persons rights, including to make decisions about what happens to them (Article 8) are respected to the maximum extent possible. A recent case from the European Court of Human Rights, McDonald v UK found that a woman forced to use incontinence pads when she was not incontinent had her rights to a private life engaged when she was made to live in a manner which “conflicted with [her] strongly held ideas of self and personal identity”. Once those Article 8 rights were engaged, the local authority providing overnight care had a duty to consider those rights when making their decision or else they would be in breach of them. This case highlights the importance of looking at all care decisions through a human rights lens. The rights in the Human Rights Act are drawn from the European Court of Human Rights, which is overseen by the European Court of Human Rights. The European Union and the European Court of Justice are completely separate. However, when the ECJ was asked to look at an employment case from the UK involving a carer, they looked at human rights. In Coleman v Attridge Law the ECJ used the ECHR human rights principle of non-discrimination when deciding whether an EU directive prohibiting discrimination against disabled people in employment applied to Sharon Coleman. Sharon, the main carer for her disabled son, worked at a law firm and was denied flexible work arrangements offered to her colleagues without disabled children. The ECJ found that disability discrimination by association is unlawful in the workplace. The case ensured that UK law provides protection against discrimination on the grounds of someone’s association, including caring responsibilities, with a disabled person. Human rights have been relied on in all of the above cases to ensure that lack of capacity or a caring role do not prevent a person from enjoying and exercising their rights. This has been something of a whistle stop tour of recent case law surrounding care, but you can read about some of these cases in more detail on this blog. So this Carers Week let’s spread the word that human rights are what it says on the tin – getting it “right” for all “humans” including carers and those for whom they care. The right to respect for family life protected by the Human Rights Act (in Article 8) goes to the heart of decisions involving children and care, reminding us to consider the both the rights of a child as an individual and their rights as a member of a family. Yet it is a human right that is often misunderstood in practice (and sometimes maligned in headlines and sound-bites). A recent decision in the family court, Re DE (A Child)  EWFC 6, is a reminder that the local authority and its staff need to understand that consideration of the Human Rights Act is an important part of making fair and lawful decisions that respect the rights of the child and the family. The case concerned D, the child of a couple with learning disabilities. D had been subject to a care plan from birth, and had been living at home with his parents who were supported by the local authority. The local authority had become concerned that D’s welfare was deteriorating and made plans for D to be taken into foster care. This would be followed by a hearing to determine the future of the care plan. The parents’ solicitors asked the courts for an injunction preventing D from being taken into care before the care plan hearing. They said the injunction should be given using powers under the Human Rights Act, because removing D before the hearing was a disproportionate restriction on their right to respect for family life. The first judge rejected this as he did not believe he had the power to grant such an injunction. At the higher court Mr Justice Baker found that the first judge had limited himself and his powers wrongly when refusing to grant an injunction under the Human Rights Act. Local authorities have a duty under section 6 of the Human Rights Act to make sure all their decisions respect the rights in the HRA. In D’s case the authorities had failed to respect the Article 8 rights to the family (discussed below). Therefore the courts, which also have a duty under section 6 to respect human rights in their decision making, can rely on the Human Rights Act to prevent an unjust decision. This means if a judge has the power to grant an injunction, a power which has recently been granted to the family courts, then they can grant an injunction under the Human Rights Act. Did the care decision therefore violate the rights of D or his parents? The right to respect for family life is a qualified right, this means officials can restrict this right when there is a law in place to allow such a restriction and when it meets one of the aims set out in the Act, e.g. to protect the rights of others. In any event, any restriction of the right should be proportionate. This means all alternatives should be considered, and the decision maker should not simply jump straight to the most restrictive option. In cases of removing a child from the family home, looking at the situation through a Human Rights Act lens means recognising that the child and the family have rights which should be respected unless the tests of lawfulness, legitimate aim, and proportionately justify restriction. For example, where a child is at danger of serious harm or neglect the Human Rights Act places a positive obligation on officials to step in and take action (this underpins safeguarding). In D’s case he was not in immediate danger, nor was there any threat of future danger. Yet he was taken into foster care before the hearing to determine the future of the care plan and the child’s best interests. If, after a full and proper hearing had been carried out, it was found to be in D’s best interests for him to be taken into foster care, the interference with his and his parents’ Article 8 rights would be justified. However, to take him into care when he was not in danger and before evidence could be heard from his parents failed to take the family’s human rights into account. D’s case simply (but importantly) clarifies that in such situations parents can apply to the courts for an injunction under the Human Rights Act. Whether the removal decision breached human rights, is a matter which must be decided at a full hearing. However, it does have a broader significance in reminding officials about the importance of taking human rights into account at every stage of the decision making process. We have blogged before about cases where decisions that drastically alter peoples’ lives have been made before their human rights have been considered and the proper safeguards put in place, such as in RR v Milton Keynes Council where the local authority failed to apply for authorisation to remove an elderly woman from her home. The decision in Re D highlights once again the weight local authorities must put on all rights when making their decisions. D’s case also raises access to justice questions, an issue of growing concern with recent changes to legal aid, which have had a particular impact in family and civil cases. Because of the specific nature of the original care plan and the changes that were being enacted, under the Children Act 1989 the family fell into a gap that left them without non-means tested legal aid. As the father had a steady, but low paying job, he was unable to access legal aid and his solicitors and barrister acted pro bono. Justice Baker highlights this gap as being a real barrier to accessing justice, particularly for adults with learning disabilities involved in care proceedings. Being unable to challenge a local authority’s care decision potentially leaves many families separated and unable to challenge violations to their rights. In particularly serious cases, being unable to contest life altering decisions may also risk falling foul of the right to a fair trial under the Human Rights Act (Article 6), which applies in many civil issues including family law. At the end of his judgment, Justice Baker specifically calls this point to the attention of the President of the family courts, Sir Justice Munby. This week he made the important decision to suspend proceedings in a case where contact arrangements for a child were complicated by his father’s inability to access representation or translation services (Q v Q).